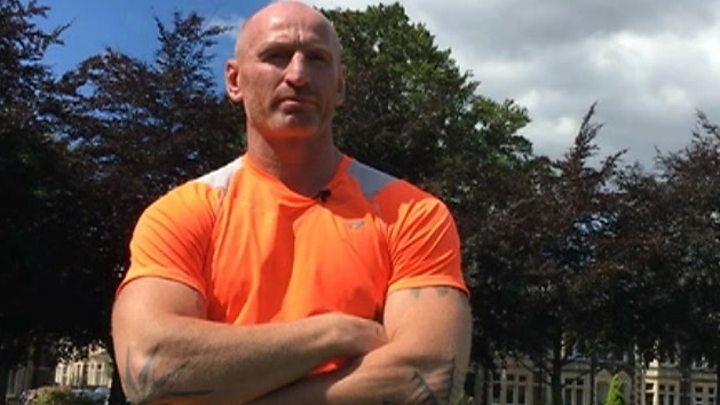 Football risks “being left in the dark ages” unless more is done to tackle homophobia in the game, ex-Wales rugby star Gareth Thomas has said. Thomas came out as gay in 2009 after hiding his sexuality for years. He admitted it almost drove him to suicide after his wife Jemma left him when he told her the truth. Thomas said unless homophobia in football was “policed as stringently as racism is policed, then it will always be a problem”. Thursday marks 50 years since the partial decriminalisation of homosexuality between men aged 21 and over in England and Wales. The former Cardiff Blues player looked at the issue in a documentary for BBC Wales. There have been no openly gay professional footballers in the top four divisions since former Norwich striker Justin Fashanu in 1990, who killed himself in 1998. Thomas spoke to Amal Fashanu, Justin’s niece, who made a documentary on the issue in 2012. “In that five years, from talking to her, absolutely nothing has changed,” he said. A spokesman for the FA said the governing body was “committed to tackling homophobia, biphobia and transphobia in football at every level of the game”. Wales’ governing body – the FAW – has been asked for comment. In recent years, ex-Aston Villa midfielder Thomas Hitzlsperger and former Leeds United and United States player Robbie Rogers have revealed they are gay. Hitzlsperger had retired and Rogers plays in the US’ Major League Soccer. In 2015, 2% of UK men identified as gay or bisexual but none of the approximately 5,000 professional footballers have publicly come out. Thomas said they would be “walking into the unknown” as governing bodies had not done enough “to create an environment for a player to feel like he can be himself”. While great efforts have been made to tackle racism, Thomas said homophobia was not treated as seriously. He spoke to a steward who had thrown out a fan for using racist language and asked him if he would have done the same had he used a gay slur. “His honest answer, which is the truth of it, was very much the case he doubts it would have been,” he said. While those throughout the game have supported efforts to rid football of racism, Thomas said “you’ll struggle to get a single player to openly talk about his support against homophobia because he stands the backlash of guilt by association. “It does feel like football is not ready for it. If a player is ready it could be a great success or it could be a great disaster. The FA said it worked with leagues, LGBT clubs and campaign groups to sanction and educate perpetrators of abuse and encouraged “players to be themselves and support their teammates to do likewise”. Thomas said while there was “no excuse” for homophobic language, he thought some fans singing anti-gay chants felt “they can be somebody who, on the outside of that stadium, would be somebody that they might look down their nose at”. He believes change must come from the top of the game: “Unless football wants to be left behind in the dark ages then it has to [improve].